Dillon Middle School is proud to announce that Chloe Dove and Charlotte Sellers, two eighth grade students, at Dillon Middle have been named 2018 South Carolina Junior Scholars. The South Carolina Department of Education sponsors the South Carolina Junior Scholars program. It identifies current eighth grade students with exceptional academic talent based on the students’ performance in critical reading, math problem solving, and writing skills on the Preliminary Scholastic Aptitude Test (PSAT). These students took the PSAT as an eighth-grader and scored a 550 or above in reading and writing or a 530 or above in mathematics. Junior scholars receive opportunities that will facilitate their intellectual growth, broaden their individual interest and promote their scholastic achievement in ways not currently available in the school program. These activities are provided during the academic school year or the summer following the eighth grade and throughout secondary school. The Pee Dee Education Center and Francis Marion University recently hosted the Regional Junior Scholars Ceremony in the Chapman Auditorium at Francis Marion University. 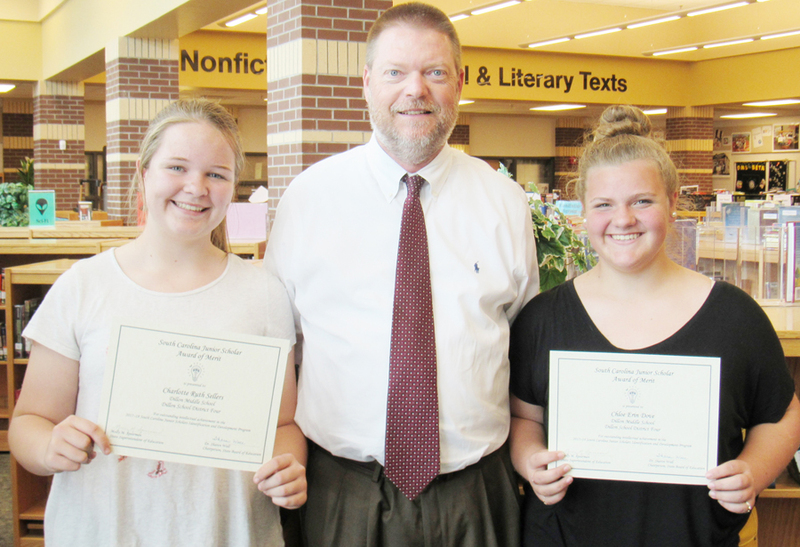 At the ceremony, Chloe and Charlotte received special recognition. Congratulations to both girls, keep up the good work!